Many years ago you could stand downtown in Columbia on West 7th Street and see a castle on a hill in the West. What a spectacular sight this must have been and of course it had to be inspiring as well. The castle was the Columbia Female Institute. It was a college for women built in the 1830’s and was in operation for over one hundred years. A victim of the economic impact of the Great Depression, the school struggled and then finally closed. 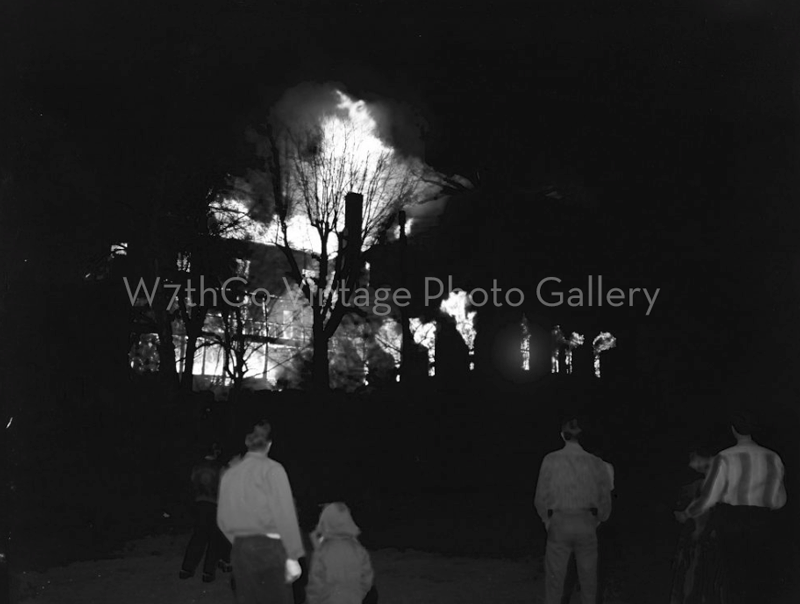 However, the building survived until one tragic day in March of 1959. Anyone old enough to have been around in 1959 will tell you they were there to see the Institute go up in flames. Parents brought children to witness the blaze. It was a total loss and the building was gone forever. Not long after, the property was sold and developed into a shopping plaza. The plaza is familiar to residents as the location of the Post Office as well as a grocery. Too often we have visitors to our gallery, including some lifetime residents of Columbia, that were not born or too young to remember and have no idea that such a place ever existed. When they see one of the photos we have of the Institute they ask, “What is that?” or want to know where it is. What a shame that the memory of the Columbia Female Institute is fading. For the school was so much more than a beautiful Gothic castle. It was a symbol of our City’s commitment to education. At a time when women were not seen as equals and not in need of formal education Columbia had a college that taught science, mathematics and more. To build such a magnificent building that must have cost a great deal, you have to know that education was very important to the citizens of Columbia in the early Nineteenth Century. It is not too often that the loss of a single building to fire can change the character of a town. However, on March 14, 1959 that is exactly what happened in Columbia. People that saw it burned knew and there are many that cried because they knew that something special was gone and the town would never be the same. Can you imagine what Columbia would be like today if the Institute had survived? If you would like to see the Institute in it’s heyday, you can see it online by clicking here.